After death … I rule, once again! Ah, Spring … a time when the back seat of my car unveils bits of granola bars and Gogurts past (along with the scents of same), my dog begins his annual uncontrollable barking in my yard at passing cyclists, and the guilt of doing very little of my best laid plans (as relates to home maintenance) all threaten to overwhelm my 40-ish brain. Luckily, as always, Metal is there, bringing me back into focus with the passion and unmistakable aural violence that helped fuel this week’s humble update. As Marty handled the last WG foray solo, so too this time do I bear the mantle alone, giving him space to scheme Bindrune’s upcoming assault on the underground. Anyway, enjoy this week’s foray into two excelling Australian exports and Denmark’s purveyors of 100% ‘true’ metal of death, and as always, post those playlists and discuss: what albums thus far in 2015 are keeping your Spring fever night-terrors in check? Having reviewed a demo of theirs back in 2012, I’d wondered if more Aussie black/death/thrash goodness would be forthcoming from these would-be progeny of other Down Under greats like Destroyer 666, Denouncement Pyre, et al, and now Dead River Runs Dry’s first full-length has arrived, and what a hellblazing scorcher it is. Taking the ability to seamlessly amalgamate multiple extreme metal genres like the aforementioned now-in-the-Netherlands-living KK Warslut and co. (along with their penchant for latter-era clean production cues), DDRD’s Hierophants of the Storm will have your spike-studded wrists grasping oranges heavenward one moment, while proudly pumping them Judas Priest-fan style the next. Each song contains riffs running the full gauntlet between classic metal and its most extreme neighbors, switching up styles continuously, but the most memorable guitar assaults are always repeated enough to enable the listener to easily discern one song from the next. For these reasons I find myself wanting to tag Dead River Runs Dry simply “metal” without prefix. Simply put, Hierophants of the Storm’s tracks are composed and comprised of sounds carefully arranged in the proper how and why of structural decision-making, creating something both extremely heavy and difficult to forget. Prime example of this classic-meets-extreme paradigm displays prominently on ‘Skull of the Wind’, a song which takes riffs that could fit comfortably on an old Whiplash cassette and then marries them up with the slavering guitars and vocals of (a ‘deathened’) version of Funeral Mist’s Maranatha. Of course, the primary influence I detect is that of their Australian brethren and forbears – the outgoing riff at 3:45 would feel completely at home anywhere on D666’s untouchable Phoenix Rising in terms of its anthemic glory and neck-cracking refrain. I enjoy straight-up, corpse-feasting death metal and corpse-painted black metal as much as the next guy, returning to each often during my spin-vinyl-wash-dishes time, but it’s never too long before the need for an odd combination of the two comes to the forefront of my plate-scrubbing soundtrack. StarGazer’s latest, A Merging to the Boundless, shows the Aussie prodigies once again neck-flailing and experimenting just as they have with previous efforts, but for those uninitiated, don’t click away now thinking this band or this album is yet another yawn-inducing display of ‘look at me!’ musical over-acting – StarGazer’s ‘prog’ (if that term even applies here) is quashed time and time again in favor of a head-pummeling Black/Death Metal that is pure, just infused with fretless bass runs that would cause Steve DiGiorgio to skidmark his undies with a ‘why-didn’t-I-think-of-that-could-have-had-V8’ moment. From the Morbid Angel/Aura Noir combo opener of ‘Black Gammon’, you know you’ve got something special invading your earholes, and though shredding solos and odd-time breaks abound, by song’s end all you be left with is the desire to start the song again – because it’s the song itself that has taken up residence in your mind’s reel-to-reel. Things get really bizarre on oddly-named second track ‘Old Tea’ (also my second-favorite song on the album) yet even amongst the fingerbone-cracking six-string chord weirdness, the droning, Snake-from-Voivod vocal of Damon Good, and demented atonal jazz rhythms of Denny Blake (both of whom split time in Mournful Congregation, Cauldron Black Ram, Martire, etc) the knowledge that riff ecstacy is right around the corner stays close at hand, and makes these adventures in genre-bending powerful and – more importantly – tasteful. On personal favorite ‘Grand Equilizer’, StarGazer’s employment of tri-chords amongst the malaise elevates the album to its heretofore hinted-at black/death greatness, as that famed structure of dark music injects a palpable eeriness into each movement of the eleven minute Hell-journey that remains Beelze-loved even during a distortion-less guitar, quietly-chorused bass interlude that sets up a triumphant, late 70s/early 80s (read: classic metal) closing to this mid-tempo, masterful track. 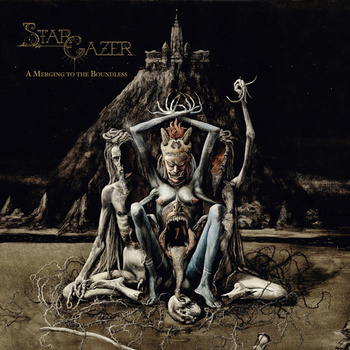 ps – StarGazer are about to embark on a tour with Undergang, also reviewed this week. Undergang have always produced the kind of death metal brain-chewing zombies would actually make if their capacities for effort expanded outside quests for warm-blooded flesh. These Danes do the true sounds of disgust and do them well: dirty, down-tuned guitars seep and scour like those on first album-Bolt Thrower. Heavily distorted bass brings an unburied, always-audible crust above the overall mix. Drums handle both doom and death’s-head-banging sections with equal aplomb, while avoiding over-blasting boredom induction. Putrid belch vocals vomit forth in Craig Pillard/undead-throat-singing monk style. And while many hoist the OSDM flag high, the energy found here has little to do with any oft-imitated Swedeath – this is tweaking-while-Autopsy-plays-though-blown-speakers, grime-ridden death, with a dash of punk attitude. This is Undergang. If you have already heard the band’s 2009 debut Indhentet af døden or 2012’s Til døden os skiller , you know exactly what to expect … however, in Undergang’s case, a listener’s ability to get what he or she expects (and for that to be a good thing) remains one of Undergang’s strongest traits. For Døden Læger Alle Sår (as on the aforementioned albums) not only continues a rotting-trio sound revered by underground death metal fiends, but also showcases Torturdød’s ability to twist staple death metal riffs just enough to make them his own. Unlike their fellow anachronistic brethren in death’s mostly weak attempts at injecting originality in composition while honoring their heroes, with Undergang, you’ll find it a bit more difficult to say “yeah, that riff came directly from ”. Instead you’ll find it easy to crack your forehead against the steering wheel when the fret-slides herald midtempo time changes in ‘Døden Læger Alle Sår’, when drums kick in on the unforgiving march of ‘Ad Ligbitum’, and when ride cymbals are victimized on ‘Kronisk Betændelse i tarmene’. And when the doom dirge of ‘Lemlæstelsens Kunst’ makes its way beneath your skin, your compulsion to crash the nearest funeral of a stranger will be overwhelming. ps – Undergang are about to embark on a tour with StarGazer, also reviewed this week. You’re callin’ all the shots…. This song has been rotting in my brain and driving me nuts all day, no matter what I play to get it out. Don’t you hate that? Back with another, although short, update. Jim and his family are on vacation and left me to hold down the fort. Didn’t get as much free time for listening to new releases like I wanted to, but 3 reviews are better than a long cold silence. But we shall return next week with a bit more for you to consume. In the meantime, hit me with those playlists as I’m always curious to see what I’m missing out on. I have always been curious about this band, but have never pulled the trigger when releases would surface for purchase. 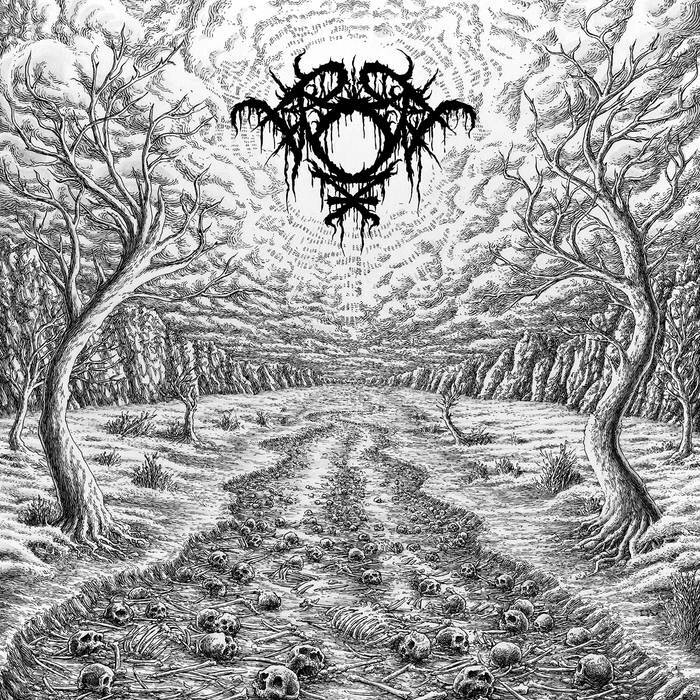 When the mood for depressive black metal hits, it is nice to have a variety to pull from, especially if there is a hint of originality arising from the audial misery. 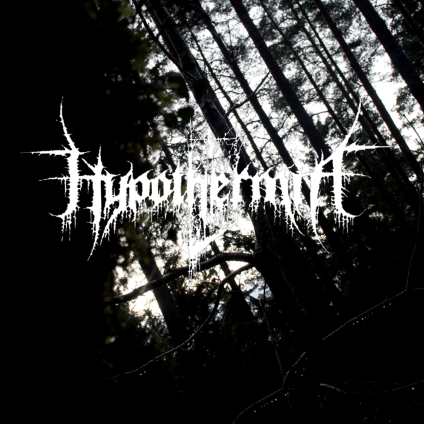 Gothenburg, Sweden’s Hypothermia are indeed walking their own path when it comes to the dreary side of black metal, but as I absorb Svartkonst, the bands 5th full-length, I’m left understanding the vibe and direction this trio is going for, but I can’t help but desire something more out of the journey. Svartkonst is depressive black metal in spirit for sure, as the mournful progressions drift along in a shroud of darkness, but the material is presented with nearly clean guitars as Hypothermia allow the natural distortion of the amps to model their sound. This allows the compositions to take on a spacious atmosphere, but the songs are so stripped down and based on repetition and straight forward drum work, that I would quickly become bored with the songs. Even when harsher distortion creeps in to infect the lazy gate of these tracks, it does little to break the monotony. The biggest void Hypothermia did not fill and would have possibly made a huge difference, it the absence of vocals. I have heard in the past that they are an instrumental band, which is likely the main reason why I haven’t investigated their previous work. In the case of Svartkonst, vocals would have been a welcomed addition to this material, for the overall flow of this album steadily stirs like a river, but it is slow moving and lacking in dynamics. Gene Palubicki is a death metal warrior. One cannot deny his blazing riff swords and ear for crafting furious hymns that devastate with intricate complexity, while never losing site of memorable songwriting. Angel Corpse was a demon of a band on stage and on CD that stands the test of time as if hurled forth by the very winds of hell. Though that band will always hold a special place in my DM arsenal, time marches on and you simply cannot destroy a warrior and his work. Enter Perdition Temple, a band that strikes me as the natural progression of Angel Corpse, but everything seems even faster and more intense/urgent. Bill Taylor has even re-joined forces with Gene on this album to further seal this twin guitar union with fire. As the Coroner-esque technical fills explode from the tracks Extinction Synagogue and Devil’s Blessed, where the bass follows the guitar mayhem perfectly, my mind is blown and it is hard to deny the astounding technical proficiency on display. Gene maintains his obvious Morbid Angel influence on this material, but you can tell he went into the creation of The Tempter’s Victorious with the intention to create some of the most fierce material of his career, while effortlessly laying waste to countless heavy hitters in the modern death metal world. The speed is teetering on the brink of chaos, but drummer Ronnie Parmer holds things together with his crushing double bass work and machine like blasting style. 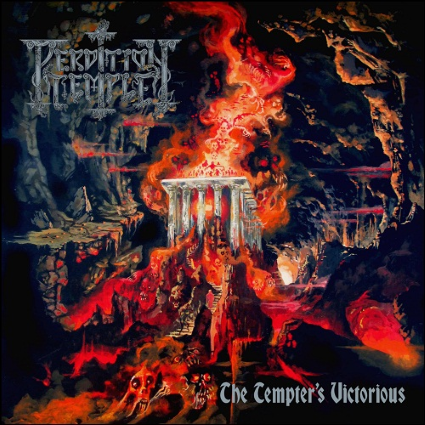 The riffs are endless and with so many tremolo shifts and whammy bar shrieked solos arising from the battlefield, Perdition Temple ask a lot of the listener to absorb and comprehend. The songs are very complex and at times alienating, but with that violent pulse in the guitar work twisting thoughts into an almost hypnotic trance, multiple listens are demanded and one begins to discern the subtle hooks to eventually heed the command. Even though I found Impurath’s (Black Witchery) vocals to be a bit dimensionless in his mid-ranged, reverb drenched croak, I soon realized that this style and performance worked well with the overly busy nature of the tracks he was attempting to empower. In the end, the music becomes the focal point and every meticulously shredded note and crushing break from the speed is crafted with madness in mind and violence in heart.